I Give gaming reviews of just about any game I have, and I take requests, so if anyone wishes me to do a review, I Would do my best to be able to get that review done. 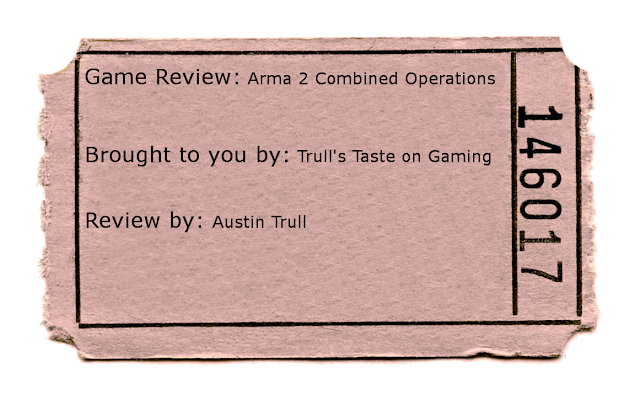 Ok so let me start off with the overview, Firstly, I would like to state that this review encompasses both Arma 2 & Arma 2 OA. Which is where the "Combined Operations" Part comes into play. But I digress, This game has ALOT going for it, which i will get into detail later on, Being this is my first blog post/review, i will state on how i will review this game. First i will start off with Graphics, then Gameplay, then Controls, then mod'ability, and at last Sound. They will be in that order aswell, so lets being with this Review! This game CAN Run on a older'ish computer, that being said, it would be best run on a older computer on medium - low settings. my settings for my old computer were usually ran on medium and in some cases i ran on low, but your FPS isnt just decided on your Graphics settings unlike most games. It is also decided on "View Distance". Thats right, view distance! This game has a slider for that, if your view distance is crazily high, and your on low settings and your computer is of decent specs, then your computer will want to strangle you after setting your view distance on max, while being on low graphics. cause you have to render most everything on the map at the time, at least until it reaches your view distance cap. Alas for those Graphics card enthusiast! This game on High - Ultra looks amazing! Not super awesome but really really good, for being how old the game/engine is! So the Graphics all depends on how your computer can run it, and how your settings are set. The games gameplay is just amazing, the variety of what you can play on this game, is just breathtaking! For example, I Played throughout my Arma 2 gaming experiance, Realism oriented missions, which I absolutely adored. I Also played in RPG style missions, Called "Life" missions. The "Life Missions" Are basically a Civilian vs. cop gameplay with Roleplaying, for those who dont know what roleplaying is in a game, I will explain in a later post. I also played in Run - N - Gun style missions, TDM For a great example, although this wasnt my personal favorite, matter of fact I didnt like it, doesnt mean though someone out there might not like, they may absolutely adore it, but i digress. Theres so many possibilitys with the ingame editor for making missions, and extensive modding community, which i will get into later. The mission editor allows for such great missions from those who have mastered its capabilities. For those who have mastered it, i envy you. The editor is something i work with alot in Arma 2. The controls in this game are a pain in the buttox to learn, and get used to, aswell as them being clunky. To me this is one of the games shortfalls. But the moment the controls click in your brain, it all becomes second nature, as long as you work towards learning the controls, which can take weeks in my honest opinion. But just because the controls are clunky, and hard to get used to, doesnt mean this game isnt for you, it will just take longer to get used to them, and enjoy the game more. What i mean by enjoy the game more is, you will enjoy the game, no matter what as long as you enjoy this genre and type of game, and once you get used to the controls, the game goes to a whole new level of fun! The reason i added modability into my list of what to rate, is because i am a big fan of mods for games, and for those games who do not have mod capabilities i am usually not going to play them for a long time as other games with modding. 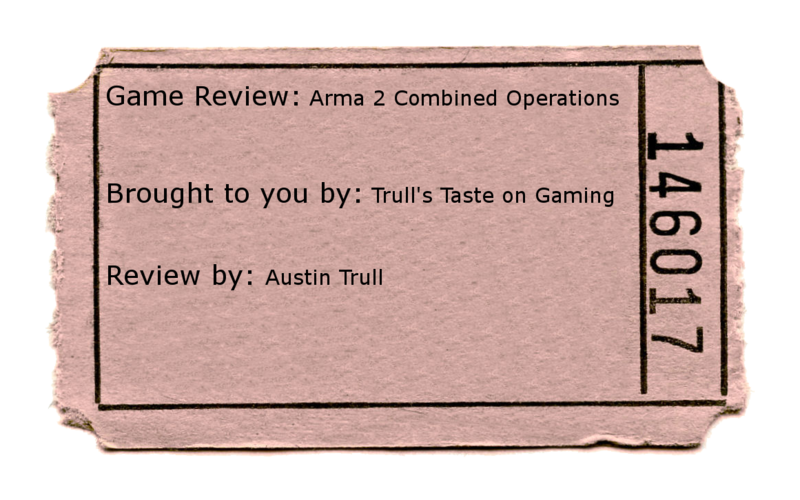 But to the review of modding in Arma, The Arma community has thousands upon thousands of mods available, through out the intranets'. That being said, The modding for this game, you can create giant maps, to the ever oh so small maps. You can make skins for the soldiers of who you play as, as well as make weapons. You can literally make anything you want, so long as you have the desire and willpower to make it. It is very confusing to make mods in this game, but this is from the view of a player, and I have no experience with modding in Any game. So i wouldnt know much about that. So it may be much easier to one person to make a mod then the next. but overall This games modability is of the best i have seen. The sound in this game is of average quality, nothing execptional but is decent, there are mods out there that can make this game sound like you were in a actual battlefield, but the base game is what im rating, so let me start of with the gun sounds. The gun sounds are pretty good. The vehicle sounds could use a bit more, specifically the Helicopters. Planes sound mostly the same, but do have some difference. Ground vehicles have good variety for sounds. But overall the game has as i said Decent Quality.